I've referenced this piece before, but I don't think I've ever really discussed it. The image you're seeing here is a poster put together in 1986 by the Child Welfare League of America. 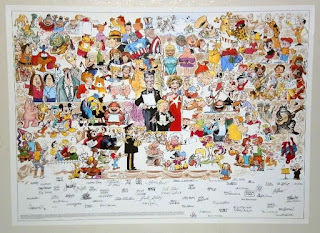 It's called "Voice for Children" and features around 170 characters, mostly from comic strips. I can't find very much solid information on its origins, but I believe it was basically a charity type piece where a bunch of cartoonists contributed a sketch of their character(s), and a chunk of the costs in selling prints of the image went to the Child Welfare League. As you can see, it's pretty much a who's who of the comics. 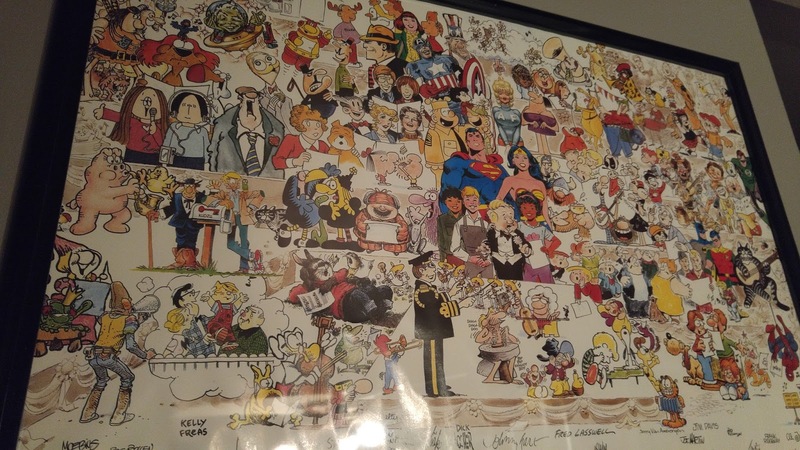 It features the work of Milt Caniff, Mort Walker, Jim Davis, Charles Schulz, Al Jaffee, Jack Kirby, Arnold Roth... I could go on and on. I don't know exactly how this was put together -- obviously 1986 was pre-Photoshop so it can't have been done digitally -- but I tend to think everyone contributed individual drawings that were copied and the copies then assembled on the page as a giant collage. I suspect after it was assembled, then Jack Davis came in and filled in some visual holes with a set of risers to help mask characters who didn't have feet drawn, or appeared to be sitting on something. Ronald and Nancy Reagan have been swapped with Superman and Wonder Woman. Batman and Robin replace a pair of soldiers. Mickey Mouse and Donald Duck are absent with Kudzu Dubose and Rev. Will B. Dunn taking their place. I'm sure you can find a few other changes as well. These changes could have been made by simply pasting new art over the previous work, certainly, but some of the substitutions would have been difficult to line up precisely. 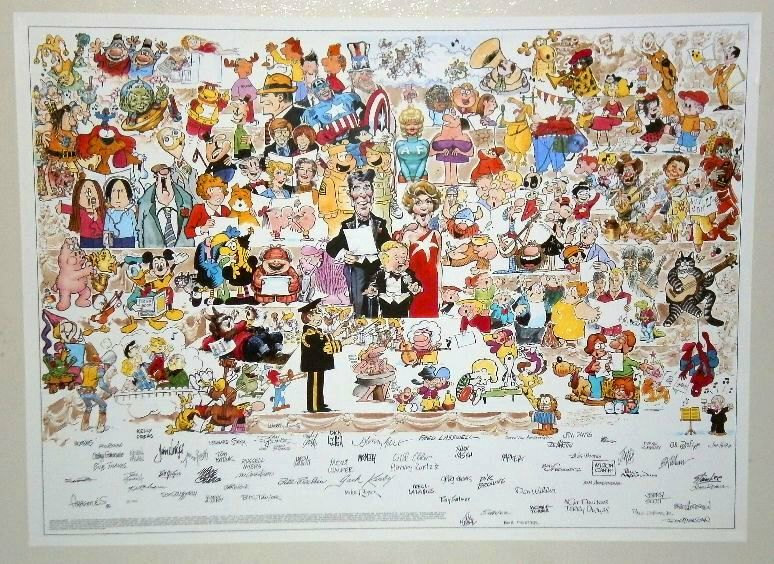 And good grief -- why would you slap a layer of glue and extra paper over such a gorgeous Mort Drucker original caricature!?! I can imagine that Mickey and Donald were removed over legal concerns. I suppose the Reagans may have been removed if somebody complained about the piece being too political? But I'm at a complete loss why the other substitutions occurred! Anyone have any concrete info on this? How it was put together and/or why it was changed? On -isms: Did Low Sales Really Kill The Crew?